The HD is an integral part of the theory of Societies of Intervention. There is a series of discourse commenting on and referring tom out area engagement of one country’s troops. The HD is focused on legitimacy and meaningfulness of such an engagement. Why are our troops in Afghanistan or Kosovo? What does it mean to us (as a society, as a family, as citizen) that our army, my son or daughter, German soldiers are serving in a country of intervention, thus forming part of the society of intervention? The HD is a trajectory for questions such as “Is our country at war?”, “Who is the enemy?”, “What is success or failure?”, “On what ethical or cultural grounds are we engaged?” etc. Some other scientists even speak of a “home-front” (Gillis Young), and of course, there is an association the “Homeland Security” concept in the U.S. after 9/11. We hold that the HD is shaping perception and opinions of the broader public, of politicians and other decision makers, and even the press; the media do not “make” the HD, they are driven by it as well, however they have, like other groups and persons, a limited influence to alter the DH. In our research, we investigate the origins and development of the German HD; we also take some comparisons, when it comes to events (9/11, Osama bin Laden’s end), the restructuring of the German Army (as distinct from other armies in the diverse alliances) or some concepts (resurfsacing of warrior- and fighter concepts, veterans and mutilated returnees, family impact of returning soldiers, dead and alive). 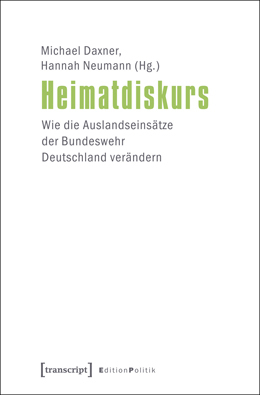 The relevance of this research is obvious: the public at large, experts and laypersons likewise, but also the media, the army, the parliament in particular, get insightful suggestions on interpreting and analyzing the HD; the basic research is conceptualizing a field that would otherwise be incorporated into a new narrative – Germany as an intervening nation – without explanation. And it may serve as a valuable tool to create public space within which affairs like the military interventions can be freely deliberated instead of becoming partisan battlefields within exclusive elites. For more information regarding the book, please consult the webpages of the publisher here.